And then there was Corky. 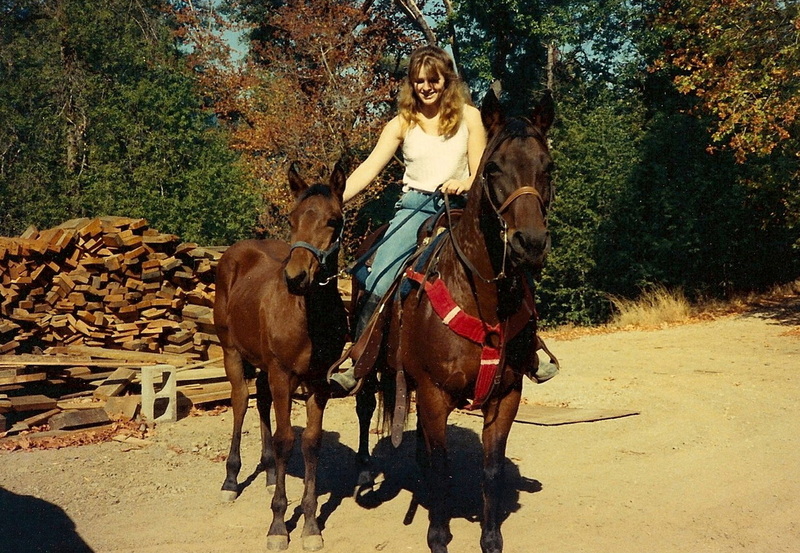 She was probably my first "heart" horse. Montoya was the second. You know the ones. They're the ones that touch you deep down inside. "Heart" horses know you better than anyone else, even better than your spouse might. They get you, and they love you completely anyway. Don't misunderstand. I loved Sunny, Nakota, and Gideon as well, but it was just different with Corky. Corky actually came to me from the very same family that gave me Sunshine. I still had Nakota and Gideon at home, so I don't remember exactly why I started hanging around their place after school. Maybe it was because Nakota had just delivered and had a foal at her side. Whatever the reason, I started riding Corky in the afternoons. I would ride the school bus to Garberville, which is 9 or 10 miles down the highway from my Dad's house, and my stepmom would pick me up after she got off work. During one afternoon visit, Chris, the owner, asked why no one wanted to buy his horses. I know now that he was just "fishing." I will, I exclaimed eagerly. Of course I would, why would a third horse be any more expensive or any more work than the two I already had? Chris nodded his head knowingly and asked how much money I had. Two hundred bucks. The money was in a savings account that I am sure was, in my Dad's mind, destined for something practical. Probably college, or some other event that was in the far distant future. I am not quite sure why I felt that he would be okay with me emptying my "for-my-future" savings account, but the deal was struck. I don't remember the money exchanging hands, and I can't even remember how we got Corky home, but once she was there, a whole new set of adventures began. That's Gideon on the left, and I am riding Corky. Corky taught me a lot about riding a forward horse. She was fast, athletic, and fearless. We vaulted logs, swam in the river, galloped long stretches, climbed steep hills, and occasionally rested in the shade of the redwood park at the edge of town. I even rode her the three miles to school one day, with Gideon ponied to the side, as a model for the Junior High Ag class. There wasn't anything that Corky couldn't do. She gave me a powerful confidence: with horses I felt knowledgable; with boys I felt empowered to be their equal and more; and with my school work I knew college was a realistic goal. I don't understand how the relationship with a horse can cause such great changes within us, but Corky was one of those who did that. When it came time for me to leave home and go to college, Corky had to find a new home, but I couldn't bring myself to sell her. It didn't seem right to sell a best friend and confidant. Instead, I found a woman who simply needed a horse to love, and I gifted Corky to her. I occasionally meet horses like Corky. And I recognize them immediately for what they are. Heart horses.